This has been the hardest thing to even consider writing. It’s taken since October 16 to even think about sharing this part of my life. Don’t even know if I can, now, get through it, but I owe my little Guinevere (Guinny) her epitaph. Guinevere was supposed to be one of our “fosters.” We had been successful in the past fostering a rescue dog until her forever home was found. This was to be a real test for us. We were warned that this young girl was very leery and had been badly mistreated. She was not trusting and may not be able to socialize. 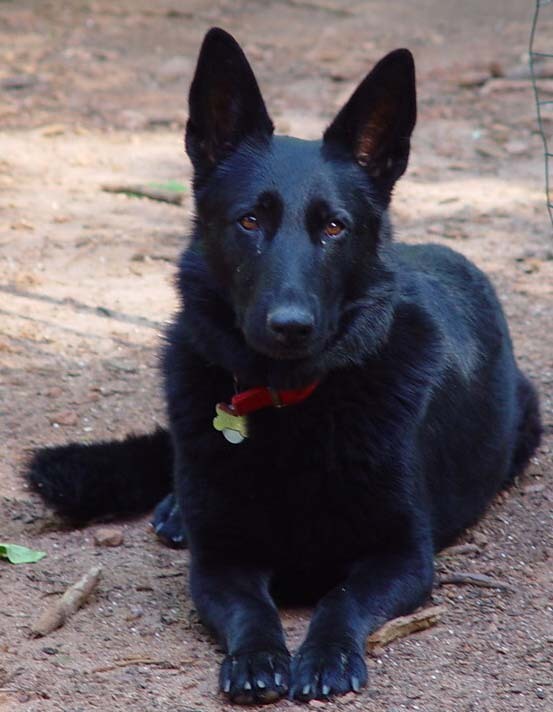 They knew very little except that she’d been thrown out of a moving car and that a kind woman had brought her in and held her until the Atlanta German Shepherd Rescue Resource could be notified. They accepted her and were hoping to find that she would be adoptable. Our job was to find out if she could be socialized. Luckily for us all, our two shepherds – Cheyenne and Blizzard (both former rescues) – welcomed Guinny and she seemed content with them. Humans? Well, that was another story. This poor dog had been so mistreated, we could only hope that we could see some glimmer of acceptance. We walked up the back deck stairs to our home and everyone came inside. Jim and I sat down and just relaxed to see if Guinevere would relax, too. Relax? A miracle happened. This poor, beautiful, small, black dog really looked at me. She calmly walked over to the sofa, jumped up next to me, put her beautiful head on my lap and sighed a sigh almost bigger than she was. She looked up at me with those beautiful brown eyes and the connection was complete. She was mine and I was hers. This connection would hold strong for more than 12 years. Through most of those 12 years I had a shadow. I could walk around my yard and know that my little girl would be right with me. Anywhere I went, she wanted to be there. It was a bond unlike anything I’d ever experienced before – and probably ever will. Times weren’t always great. There was the time I almost lost her in 2003. We had just moved to Michigan in August, and for some unknown reason some of the other dogs ganged up on Guinny and just about tore her apart. Luckily the vet is only 5 minutes away and she got Guin stabilized enough to move her to the larger clinic where she would have round-the-clock supervision. There were 10 days of going to the clinic for a couple of hours every day (including after work) to lie on the floor with Guin’s head in my lap while she recovered enough to come home. The reintroduction went well, and we’ll never know what caused the whole episode. There were other tussles with Liesel over the years, but – for the most part – they got along well. Several years ago, I noticed that Guinny was starting to have trouble with food. She’d always been a slight, small dog (only around 55 lbs at her best – like in the photo). However, she was losing weight and something just didn’t feel right. Her energy level was also flagging a little, but I’d hoped it was only that age was starting to kick in a little. Sadly, it was not just age. It was mega-esophagus. Mega-esophagus is a condition where the esophagus is enlarged and does not move food along properly. We controlled it for years with medication, elevating her food dish, and having her walk upstairs after eating. I was warned, though, that this condition only worsens. I was in denial. The last year of her life, Guinny and I had some real trials. It became harder and harder for her to eat. She began to vomit, and aspirate some of the vomit and food. She had to take antibiotics along with the medication that did its best to move the food along in her system. We spent many sleepless nights with Pepto-Bismol and attempts to find some comfort. Through it all, my little girl was stoic and loving. She tried so hard to be well. Good days were a cause for rejoicing. Bad days were hell. The roller-coaster of our lives seemed to be on a terminal downhill. It was. We made so many trips to the vet. Each time we tried something new. Nothing was working. Guinny was losing weight so fast and the sparkle was leaving her eyes. She was a truly sick girl. She tried and tried to be normal. It just wasn’t going to be. Finally, one of the newer vets told me the truth. Guinny was starving to death. She could no longer absorb the nutrients from the food. No matter what I tried to feed her, it was coming out almost as fast as it was going in. The time was short. One night near the very end, we were up walking around (that made her more comfortable than trying to lie on the floor). She’d stopped trying to get into the bed with me (she’d almost always had to have help as she was short and the bed is tall), but would lay right next to me on her covered, foam bed. Neither of us could sleep. She was in pain and I was wrestling with the knowledge that I had to help her out of her misery – no matter how much of my heart would be cut out. I went to sit in my recliner and Daddy helped her up into my lap. We reclined and she snuggled up against me for one last time. We both slept the best sleep we’d had in a long time. We both were taking strength from each other and I knew that this was the last time we’d have this snuggle. On October 16 – two months to the day after her sister, Liesel, went to the RainbowBridge – Guinny, Daddy, and I went to the vet’s one last time. We were all together as the time came. She fought against the sedative as she’d fought against the pain and all the struggles in her life. I did my best to convince her that it was okay to go to sleep. I know she didn’t want to leave me. I’m sure she knew how lost I would be without her. But I knew how sick and in pain she was. She deserved her rest. Rest did come – quietly. It was her release. I don’t know if mine will ever come. She still has a hold on my heart. I’m so lucky to have Jim. He understands in his heart – because of the loss of his Liesel – what I feel. I also have our silly, Chief dog. He’s such a joy. I also have been blessed with so many good friends who understand and support me. I know, in time, the hurt will dull. I also know that there are other dogs out there that need a home and I’m sure another will come to join our family. That won’t be for a while. I know that there will never be another Guinevere in my life. I also know that I was so greatly blessed to have had HER in my life. I know how rich my life was even if now I only feel poorer for her not being in it anymore.